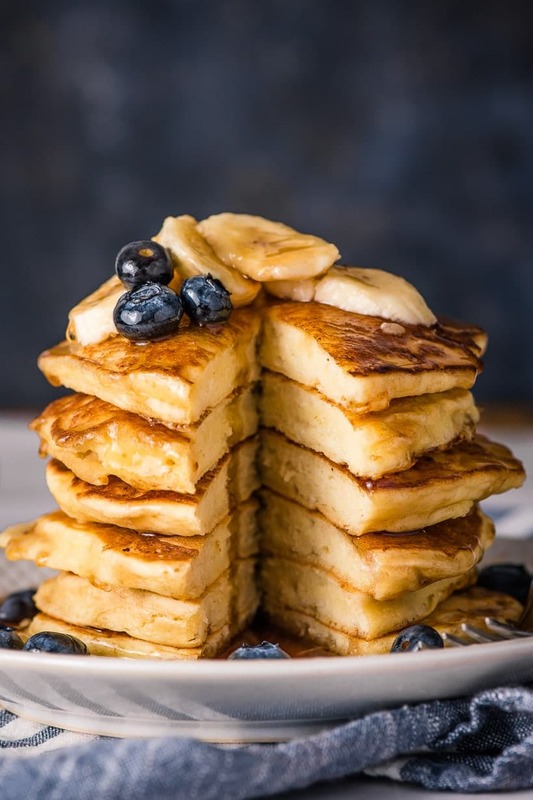 If you’re looking for the fluffiest pancakes around, look no further than these easy Ricotta Pancakes! There are two kinds of people in this world. People who love pancakes, and people who are wrong. That’s right, I said it. Pancakes are the best, and anyone who disagrees can fight me. Or meet me for coffee and a friendly debate. I’m up for either. Listen up, pancake haters. I get it. I’ve had pancakes that were thin and flavorless, rubbery, gummy, or only slightly removed from the taste and texture of cardboard. But once I had great pancakes—I’m talking thick, puffy, buttery, fluffy pancakes—French toast just couldn’t compare. 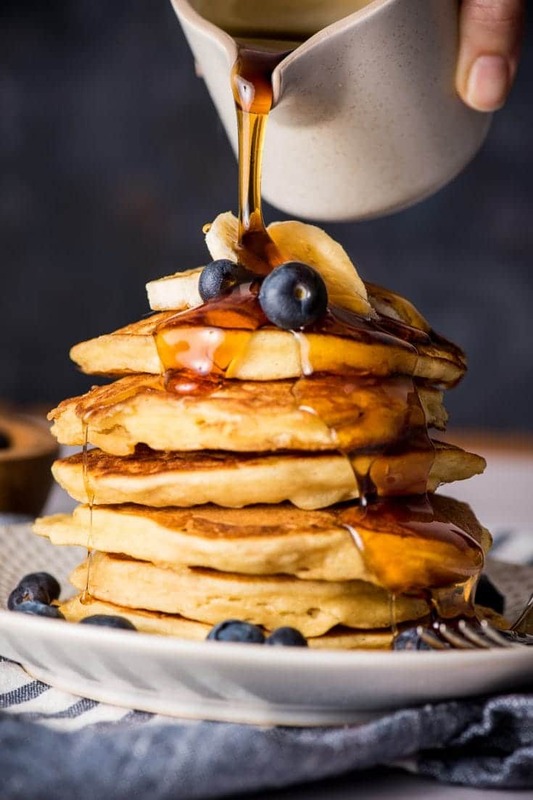 My favorite weekend breakfast is a plate of hot-off-the-griddle pancakes, topped with a dab of butter and smothered in real maple syrup. Sometimes I add bananas or peanut butter, sometimes a side of bacon. Occasionally I make strawberry and chocolate chip pancakes. But really, when you start with amazing pancakes, you don’t need all the extras. Before ricotta pancakes entered my life, these Perfect Fluffy Buttermilk Pancakes were my go-to. 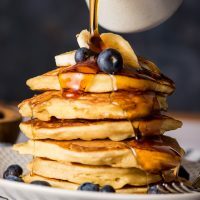 They’re my first love, the recipe that convinced me it was 1000% worth it to ditch the box and make pancakes from scratch. That said, this ricotta pancake recipe is giving my old favorite a run for its money. I know, I know. Ricotta in a pancake probably doesn’t sound all that appealing. After all, isn’t that the stuff we put in meatballs and lasagna dip? Why yes, yes it is. And that same secret ingredient that makes moist, tender meatballs and creamy pastas also happens to make the richest, fluffiest pancakes around. In case you’re worried, these pancakes don’t taste cheesy or like lasagna (thank God). The ricotta just makes them extra moist and fluffy, with a custardy texture that is positively divine. If you have time, allowing the batter to sit for 10-15 minutes before cooking will also aid in fluffiness. I usually just let it sit while I preheat the griddle. Speaking of the griddle, make sure it’s hot before you place any batter in the pan. It’s ready when drops of water sizzle on contact. 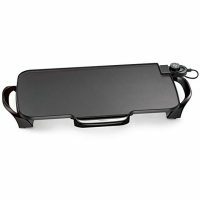 I love using an electric griddle for these because you can make a lot of pancakes at once, and the completely flat surface allows them to cook more evenly. I prefer frying pancakes in butter. 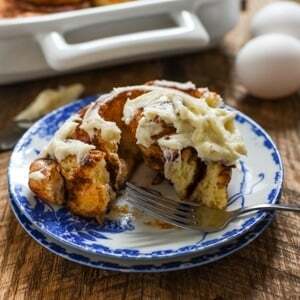 The combination of butter + the hot pan forms the perfect crispy edges and custardy centers. If you want to use this recipe as your standard pancake recipe, it’s absolutely perfect as is. But if you’d like to give them a zesty twist, feel free to omit the vanilla extract, and replace it with a Tablespoon of lemon juice and the zest of one lemon. 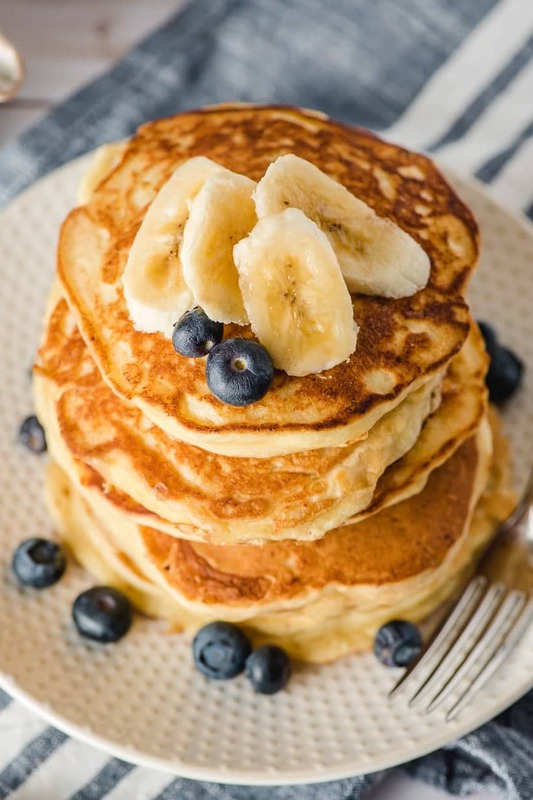 I like to serve these ricotta pancakes with fresh berries and maple syrup or sliced bananas and pecans. If you make the lemon version, a couple of blueberries dotted into the batter while they’re cooking is heavenly. Absolutely! 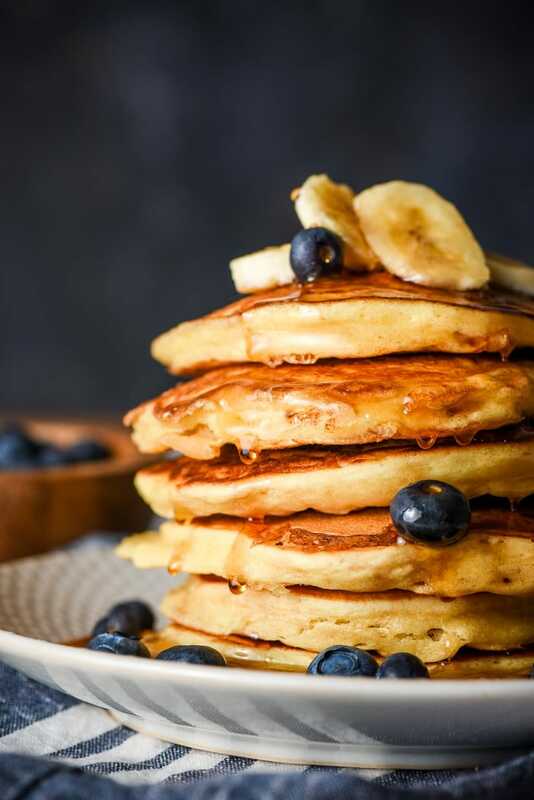 This pancake recipe makes just enough for our small family, but you can absolutely freeze any leftover pancakes! These easily reheat in the microwave and can make for a great quick and easy breakfast treat. I hope you love these as much as my family does! If you give them a try, come back to let me know what you think! The addition of ricotta cheese makes these pancakes rich, fluffy, and luxurious. They're perfect by themselves or with your favorite toppings. In a bowl, whisk together the flour, baking soda, baking powder, salt and sugar. In another bowl, whisk the ricotta, milk and 2 egg yolks until most of the ricotta is smooth and not clumpy. In another bowl, quickly whisk the egg whites. They don't have to be beaten into peaks, they just need to be thinned out a bit so they're easier to incorporate. Add the ricotta mixture to the flour mixture and stir gently until mostly combined. It's actually good if the batter remains a little lumpy. Gently incorporate the egg whites. Allow the mixture to sit while you preheat a skillet. Heat a skillet over medium heat. It's ready when a drop of water sizzles on the surface. Add a dab of butter or oil to the pan (I prefer butter). Place 1/4 cup dollops of batter onto the hot skillet. Cook until bubbles appear on the surface. Flip and continue to cook until heated throughout. Repeat with remaining batter. 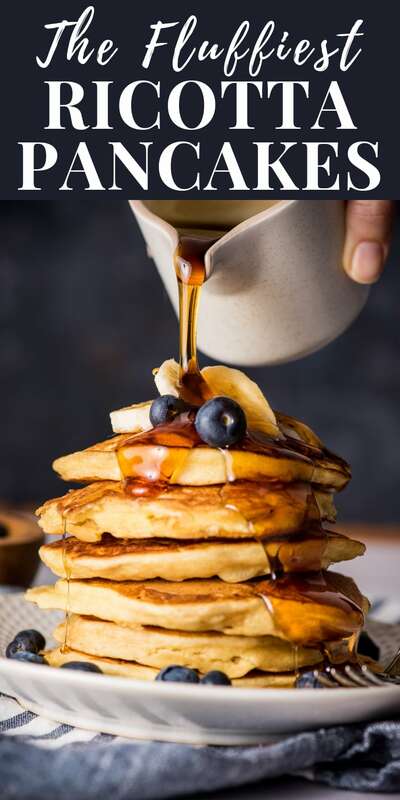 To keep cooked pancakes warm, place them on a cookie cooling rack in an oven set to the lowest temperature it will go. 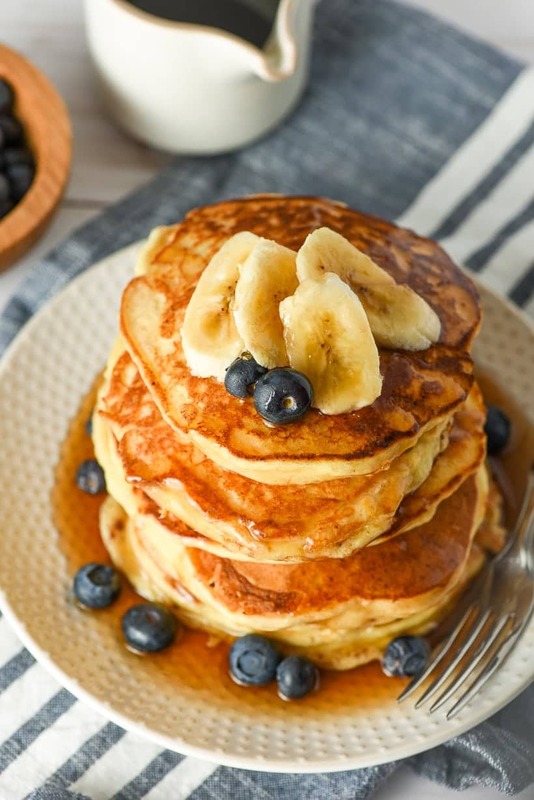 Serve warm with berries, bananas, and real maple syrup. (Or whatever toppings suit your fancy). Please note nutritional information for my recipes is calculated by a third party service and provided as a courtesy to my readers. For the most accurate calculation, I always recommend running the numbers yourself with the specific products you use. I had leftover ricotta from a lasagna we had recently so this post arrived at the perfect time. The pancakes were so fluffy and delicious. There’s a lot of protein in them too so I felt satisfied for longer than usual. I found that cooking them in butter with the grill pan over medium heat on the stove caused the butter to smoke and burn slightly. Next time I will try using oil on my pan and see if that works better. The hubby said these were much better than the store bought mix we usually use. Thanks for a great new recipe Courtney! I always love hearing your reviews! I’m glad you guys liked the pancakes. I seem to always have ricotta leftover from anothe recipe, so this is my new favorite way to use it up! 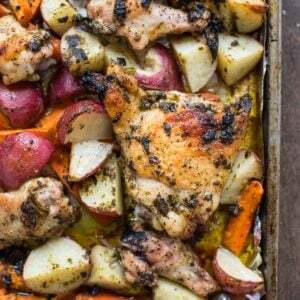 Wow, This looks yummy also easy to make. I think it will be the perfect meal for breakfast. I will try it for sure. Thanks for the sharing such a yummy recipe with all of us.